My how time flies. It’s been two months since we completed WDW46 and over a year and a half since we created the idea of riding every Walt Disney World ride in one day. We were interviewed on national radio shows, featured in newspapers and on podcasts and even turned up on both local and national news television programs. Perhaps strangest of all was being interviewed by the in-flight magazine of Norwegian Airlines! Who would have ever thought WDW46 would be so far spread? Since then we are happy to see others becoming excited about WDW46 and attempting it themselves. We have heard from readers from all over the country and even other parts of the world who have asked for advice and informed us that they were going to attempt similar challenges themselves. We are pleased to have inspired so many who now have a guide map to follow. 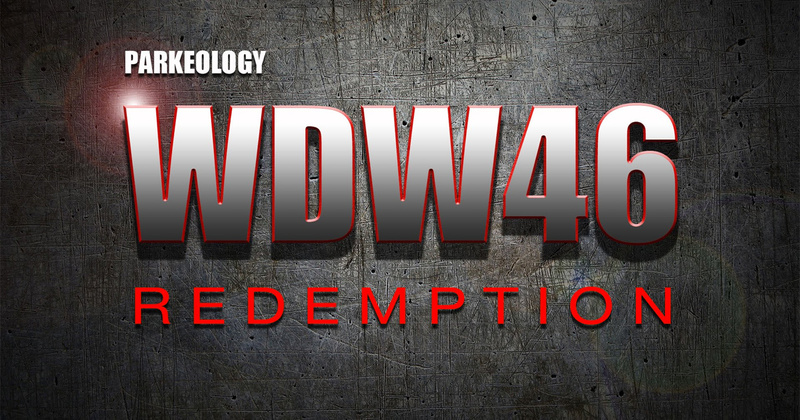 We created WDW46 not for notoriety but rather because it is crazy, silly, challenging and just plain fun. It represents everything we enjoy about the Disney parks and doing it with your friend makes it that much better. Today we are proud to not only premiere the video of our WDW46 attempt but also to announce that we have started the official Parkeology WDW46 Challenge! You will see new links on the page (or click here) that will take you to the Parkeology WDW46 Challenge page. We will be keeping track of all the attempts and we may even be awarding prizes for successfully completing it. Get a team together, get in touch with us and get out into the parks. Good Luck! Do us one favor: share the link to the video and get the word out! Finally one last thank you to all the folks who cheered us on both on Twitter and especially to those who turned up in person and tracked us down. Thank you so, so much, it meant the world to us! This entry was posted in Theme Park Life and tagged one day every ride, Walt Disney World, wdw46, wdw47. Bookmark the permalink. Register for the Parkeology Challenge! New Parkeologist – NOW WITH VIDEO! These are truly historic times of human achievement. First WDW46. Then 2 climbers free climb the sheer face of El Capitan. Those other guys are ok… I guess. Took them 19 days. We did WDW46 in 17 hours. You be the judge. Amazing video that tells an even greater story. I’ve been eagerly awaiting this since you published the trailer and it was worth the wait! Keep up the great work. Shawarma! Love it! Disney’s Mightiest Heroes are VICTORIOUS! Glad you stuck around to the end Ben! Ted, I’m the one who made a creative edit suggestion for you last week on Twitter. The last scene would have been a great spot for it. Oh well. Enjoyed the video. Love you guys’ (or as we say in Oklahoma, “y’all’s”) sense of humor. Keep the posts coming. Thanks Greg… As much as your suggestion of a fart joke would have fit in the fact is that I spent 90% of the editing time removing actual farts from the footage. I don’t want to embarass him but Shane can barely move more than a few feet without letting one rip. It was like a bad Eddie Murphy in a fat suit movie. It took two months to carefully mix the audio to remove the near constant stream of gas so the last thing I was going to do is add any in there!!! Wow, thanks for the excellent play-by-play, it captured all the emotion, drama, and tension of what must have been a truly ulcer-and-blister-producing 17 hour trial. However, that’s what makes the victory all the sweeter. Not only are you two Theme Park Masters, you’re a comedy duo. I can’t help but marvel at all the background people in the video who had no idea that they were in the very presence of greatness. Congrats on a truly epic win! Ha! Very kind words Melanie… Thank you! While I accept greatness Shane’s humbleness allows him to only be semi great. Looks like Executive Producer Famed Naturalist John Muir has been hard at work! He is the most talenetd famed naturalist of all time!